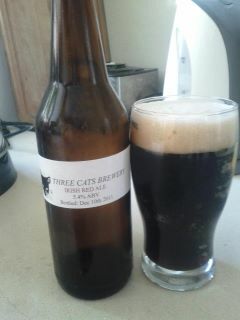 Three Cats Brewery - Beer with Claws: Does this look funny to you? For a few brew cycles now I've had a nagging feeling that something is wrong. Those of you who are particularly sharp-eyed can see the "Irish Red" written on the label. But even the duller-eyed readers will have to admit that while the beer looks very nice, has a nice head on it, and looks inviting to drink, it is not, well, red. It was a mystery. All signs seem to point to something in my process, but what? What could I possibly be doing that would roughly double the SRM value of my beer? And more importantly, how do I stop it (and what'll it cost me?) I was stymied. A quick peek at my recipe in BeerSmith and my LHBS website confirmed my suspicion. I had used Roasted Barley in my recipe which, according to BS, came in at 300SRM. My LHBS, on the other hand, was selling Crisp Malting Roasted Barley which comes in at a whopping 884SRM!. Likewise the chocolate roast (which was part of several other "British" beers) was also 200SRM darker than what I used for my calculations. I changed the value of Roasted Barley in my recipe to the one that I actually used and... Presto! my red ale turned into the exact shade of brown I saw in the glass. Amazing! Plus, now that I know what my recipe actually made I could look it up and figure out what to call it. It certainly wasn't an Irish Ale, but it did fit quite well in the category of Brown Porter. Nice. I'll take it. So from now on I'm going to make sure I know what I'm actually getting when I buy ingredients. This may sound obvious, but it's not. There's such a verity of malts out there that may have similar or even identical names but wildly different characteristics, that you have to really know what you're getting if you want to make a particular kind of beer. I'll keep that in mind for the future. In the meantime, I have a whole bunch of nice, eminently drinkable brown porter to get through. And then I'll make an Irish Red. One that will actually be, well, red. that's where a side-by-side malt color chart comes in handy.